German voters gave Chancellor Angela Merkel the green light for a second term on Sunday, along with a clear mandate to form a new government with the liberal Free Democrat Party (FDP). But just what exactly is the new government likely to do? Merlek has been quick to pour cold water on any idea of early tax cuts, “I expect we’ll agree very quickly on tax policy, especially when you look at the leeway we have with the budget," she is quoted as saying. Angela Merkel's room for maneuver is limited by the fact that Germany has been steadily racking up debt to tackle the crisis. Only today the Federal Statistical Office have said that the deficit in the overall public budget increased to euro 57.2 billion in the first six months of this year from euro 6.9 billion a year earlier as spending rose sharply (8.1%) and revenue declined (1.7%). 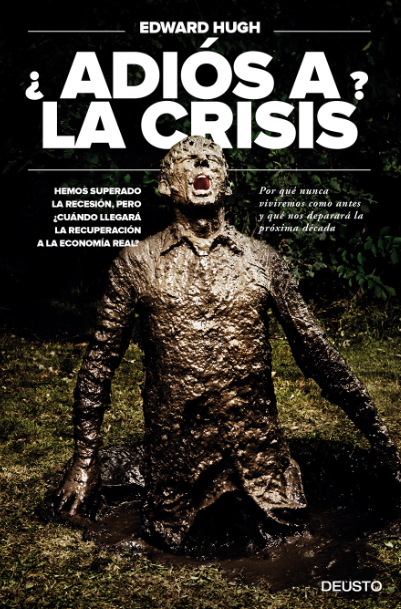 No figure was given as a proportion of gross domestic product, but it seems to be around 4.89% of the GDP registered in the first six months (unadjusted GDP was reported by the Federal Statistics Office as €1,168 billion over the same period). So, while the mood in Merkel's Berlin headquarters was naturally jubilant, the euphoria will not last too long, especially since things are not going to be anything like as simple as they may seem at first sight. The problem, of course, is an economic and not a political one. Simply put, Germany’s apparent recovery from recession may have come "just in time" to see Angela re- elected, but the good economic news may not last much longer than today. Europe's Economies Buoyant But Not Ebullient? While talk of a Eurozone recovery continues unabated following a recent heavy slew of data, including the business surveys for September and the summer consumer spending numbers from France, which tend to suggest upside momentum. 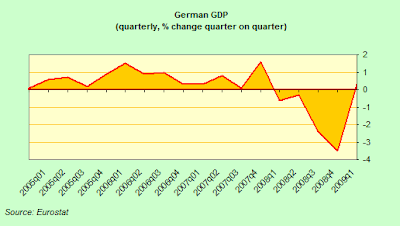 The data continue to support the idea of continuing recovery in the third quarter of 2009 but a more careful examination suggests that the German economy is not building up as much underlying momentum as was prviously hoped, and that sustaining this timid growth into 2010, especially as government stimulus programmes are pulled back, may prove to be hard work. In France, the latest household consumer data pointed to 1% monthly falls in spending in both July and August as a rebound in inflation and further job losses continued to weigh on consumption. The untick in French inflation while price index numbers remain lodged in negative territory in Spain, Ireland, Finland and even Germany, constitutes just one of the rapidly looming headaches for the ECB. The weaker French consumption trend was, however, offset by a fairly solid performance in both the industrial and service sectors, with the PMIs powering above the critical 50 level. Similar improvements were not, however, matched in Germany, where both the IFO survey, the Retail PMI and the Manufacruring and Serivices PMIs came in below expectations. So France, far from being a harbinger of things to come, may well turn out to be an exception in a region characterised by stagnation (at best) or continuing sharp contraction (Ireland, Finland, Spain). Just this cautiousness about the fagility of the recent stabilisation in the Eurozone was underlined by Bundesbank President, Axel Weber in an interview with Market News. Mr Weber was at pains to stress that he still considers the current level of interest rates to be appropriate and that it is still far too early “to exit the currently extremely loose monetary policy.” He also warned that the recovery will be “very sluggish”. Mr Weber placed considerable emphaisis on the behaviour of bank credit, stating he did not expect any turnround in the present decline before mid-2010. Clearly this is likely to be the decisive indicator for the ECB to begin withdrawing liquidity. 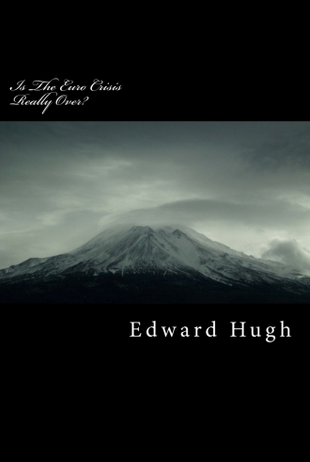 “As we come out of this crisis and as the economy recovers and as the credit cycle turns, I think we do have an obligation to decisively counter long term inflation risks,” he said. If we come to examine the German situation in more detail, then we can see that M. Merkel's room for manoeuvre is going to be extremely limited indeed. Economic growth managed to scrape together a 0.3% increase in the second quarter, but this was driven by exceptional measures of 85 billion euros to lift spending and subsidize jobs, measures which surely helped keep unemployment below levels in many other OECD economies, even while the economy suffered the hammer blows of its worst post-World War II recession. However, the positive feedback impact from so much government spending can't continue like this, and Angela Merkel knows it, and she she also knows that it is either pain now or pain later, then my bet is she will use the political capital accruing from the first post election year to put the German house in order, in the hope of being able to offer some tax-cut based upside in the second half of her mandate. That is to say, if you are hoping for some more German consumer expansion tow to help pull your own local economy out of the mire, then I suggest you forget about it right now. Q2 GDP Growth A Statistical Quirk? First off, the 0.3% growth obtained in the second quarter was actually the outcome of quite a complicated statistical balancing act. As is illustrated in the chart below the small final balance is actually obtained after cancelling out two much larger elements, the inventory run down (which subtracted 1.9 percentage points from the final total) and net exports which (which added 1.6 percentage points, where the positive balance was produced by a much larger drop in imports than the drop in exports). So while it may not be absolutely correct to talk about a statistical "quirk", and while it is obviously true that there was some real growth, there was so much noise going on in the background that it is hard to know what importance to put on the headline numbers. As should be obvious it is very hard to attach too much importance to the ideat that houshold consumption added 0.4 percentage points when there are such large percentage swings impacting other items, and the fact that the trade impact was achieved by having exports down 1.2% on the quarter while imports were down 5.1% only adds to the lack of conviction which can be attached to the idea that "Germany has now returned to growth", even though this headline perhaps has sold more papers in recent weeks than virtually any other. In fact as should also be abundantly clear from the two charts below, the sharp fall in exports was largely halted in the second quarter, while the fall in imports continued, but again, it really is stretching the point a bit to call this a solid return to growth. So with the stimulus programme now steadily set to come off from this point on, and unemployment looking certain to jump and consumer spending to drop as we enter 2010, and with many companies continuing to warn of a credit crunch, while debt remains at very high levels, policy makers would seem to be left with few options to counter any eventual double dip should there be no sharp upturn in world trade. 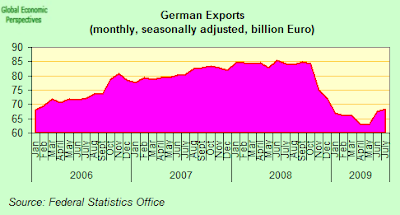 In fact the German economy will never recover on the back of domestic demand, which is weak, and tends to lag behind movements in exports and in GDP. 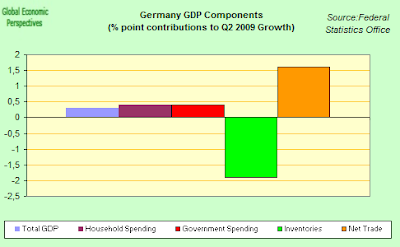 So really a full fledged German recovery must await recovery elsewhere, and in the meantime we are left with simply marking time. 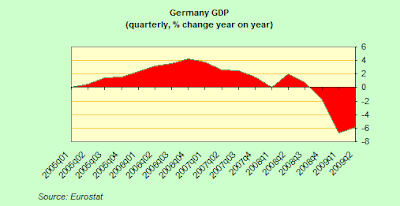 German second-quarter real gross domestic product rose 0.3% from the first quarter, when it fell back 3.5% from the previous one. Year on year the economy was down 5.9% in the second quarter. Exceptional stimulus measures amounting to some 85 billion euros have so far helped spending hold up and made it possible to keep people on short time working, but this situation obviously cannot continue much longer and even Germany’s 5 billion-euro “cash-for- clunkers” program has now come to an end. The premium led to a 23 percent increase on spending on vehicles during the first six months of 2009, spending which evidently had a lot to do with the second-quarter rebound. The unemployment rate is set to jump to 10.3 percent in 2010 from 8.1 percent this year, according to the latest IWH institute forecast. The also predict that consumer spending will drop 0.7 percent in 2010 after growing 0.5 percent this year. And the most recent data results are only likely to add to policymakers’ concerns about the sustainability of Germany’s recovery. The country’s economy is still expected to shrink by about 5 per cent this year, with the under-utilisation of capacity bound to feed through into higher unemployment – which in turn will act as a further constraint on growth. 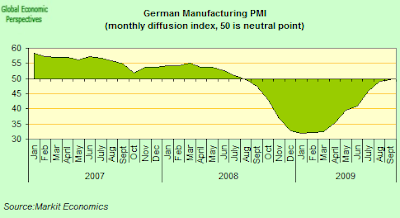 And as if to offer yet more evidence that the crisis is far over, the VDMA industry group said this week that orders for German machinery and factory equipment were down 43 percent on the year in August. Domestic demand is congenitally weak, and lags behind export and headline GDP gowth. As a result it is not especially surprising to find that retail sales fell for a the third consecutive month in July. Sales, adjusted for inflation and seasonal factors, decreased 0.8 percent from June when they fell 1.8 percent from May. 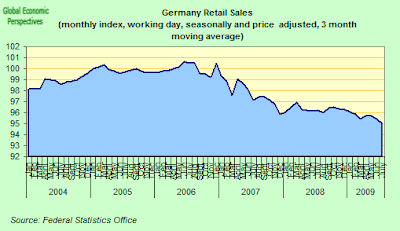 From a year earlier, sales fell 0.7 percent, but this number is not especially significant, since, as can be seen in the chart, German retail sales have now been in decline since 2006. Spain's retail sales fell again in September, according to the Markit Retail PMI which came in at 47.9, disappointingly weaker that the 49.5 reading registered in August. The index has been below the neutral 50.0 value during every month since June 2008, and the latest reading pointed to the sharpest rate of contraction for three months. Anecdotal evidence attributed the drop in like-for-like sales to weak economic conditions and subdued willingness to spend among consumers. There were also a number of reports in the autos sector that the end of the government’s ‘cash for clunkers’ scheme had contributed to lower sales compared with the previous month. Despite some slight uptick in houshold consumption, overall domestic demand, which includes both final consumption expenditure and gross capital formation (including changes in inventories), was down by 2.5% in Q2 over the same period in 2008. A large part of this decrease was due to the performance of gross capital formation, which was down by 16.0% year on year. The massive slump in real capital formation in machinery and equipment therefore continued and even accelerated in Q2, with German enterprises reducing their capital formation in machinery, equipment and vehicles by 23.4% compared with the second quarter of 2008. And the trend looks set to continue, if the latest report from the Frankfurt-based VDMA machine makers associationis anything to go by. 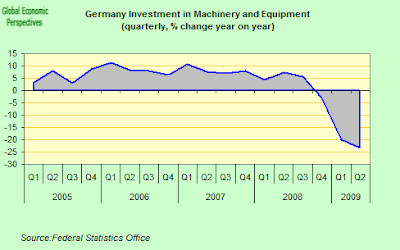 VDMA said German plant and machinery orders declined 43 percent in August from a year earlier. Export orders slumped 41 percent and domestic orders dropped 45 percent. 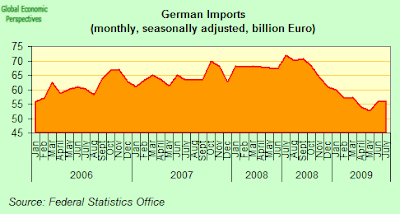 Looking into the third quarter German exports rose for a third month in July as global trade picked up generally. German sales abroad, adjusted for working days and seasonal changes, increased 2.3 percent from June, when they jumped 6.1 percent. Exports were still down 18.7 percent from a year earlier. Imports remained unchanged from June, when they increased 5.9 percent. As a result the trade surplus increased to 13.9 billion euros from 12.1 billion euros in June. The surplus in the current account, the measure of all trade including services, was 11 billion euros, down from 13.5 billion euros in June. But all in all, the balance during the first moth of the third quarter was positive, even if only marginally so. On the other hand, industrial production output numbers for Junly tempered hopes for a further rebound, since they fell back a seasonally asjusted 0.76 per cent compared with June’s figures, according to Eurostat. According to the German Technology Ministry the strongest performing sectors in recent months have been those producing investment goods and “intermediate” products, shipped for completion elsewhere. Eurozone Flash PMIs generally showed a continued improvement in operating conditions in September, although the rate of improvement slowed somewhat, and indeed the German private sector slipped back even if it continue to maintain a general expansion. France did generally rather better. However, this does start to suggest that the easy part - stopping the slide - may now be over. We have stopped the fall, but restoring growth may well prove to be a very tough nut to crack indeed. The Markit Flash Eurozone Composite Output Index - based on a sample of around 85% of the normal monthly survey - edged up from 50.4 in August to 50.8 in September, signalling a marginal increase in private sector output for the second successive month. 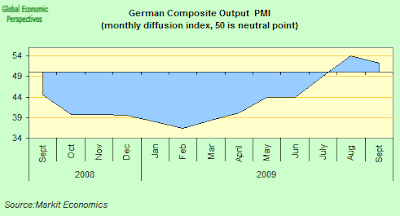 The flash German Composite Output Index stood at 52.2 ( following 54.0 in August), a 2-month low. Manufacturing new export orders weakened slightly in September, but growth on average in the third was the most pronounced since the first quarter of 2008. Anecdotal evidence suggested that overall demand had improved as a result of more favourable economic conditions and a corresponding rise in confidence among clients. Moreover, a number of investment goods producers pointed to increased exports to emerging markets in Asia. The German flash Manufacturing PMI came in at 49.6 (49.2 in August), a 13-month high, but still just shy of the critical frontier separating overall expansion from contraction. 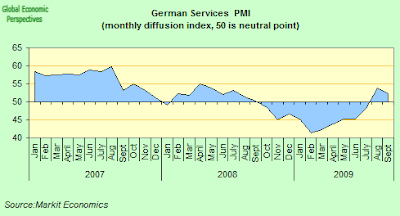 The German Flash Services Activity Index came in at 52.2 (53.8 in August), again a 2-month low. 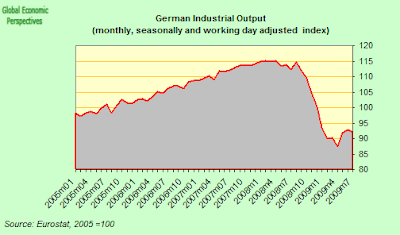 And the weakening in German activity seems to have been concentrated in the services sector. Service providers were again upbeat about the outlook for the next twelve months. The balance of firms expecting a rise in business activity was the highest since January 2006, largely reflecting optimism that economic conditions will gradually improve in the year ahead. Nonetheless, private sector companies remained cautious in their staff hiring decisions in September. Overall employment levels fell for the twelfth successive month, largely reflecting a marked decline in the manufacturing sector. Job cuts were linked to output and demand remaining at relatively low levels, with the recent change of direction not yet sufficient to prevent staff restructuring. Furthermore, backlogs of work decreased for the seventeenth month running, suggesting that firms had adequate staffing levels for existing workloads. German investor confidence jumped again in September,to hit yet another three year high as stocks surged and election day approached. 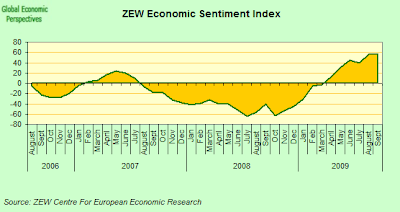 The ZEW Center for European Economic Research said its index of investor and analyst expectations rose to 57.7 from 56.1 in August. The benchmark DAX index has now rebounded 52 percent from its March trough and reached the highest level in almost a year last week. At roughly the same moment the survey result was released the European Commission forecast that the German economy woul barely grow in the fourth quarter after expanding an anticipated 0.7 percent in the third one. My feeling is the Q3 estimate is too high, but the fourth quarter prognosis seems very realistic. German consumer confidence rose to a 16-month high as the economic recovery boosted households’ income expectations and willingness to spend. GfK AG’s sentiment index for October, based on a survey of about 2,000 people, increased to 4.3 from a revised 3.8 in September, the Nuremberg-based market-research company said in a statement today. That’s the highest reading since June 2008. GfK’s measure of economic expectations turned positive for the first time since June 2008 and jumped to 3.4 from minus 7.5. A gauge of income expectations rose to 16 from 8.8 and an index of consumers’ propensity to spend increased to 36.5 from 31.1. 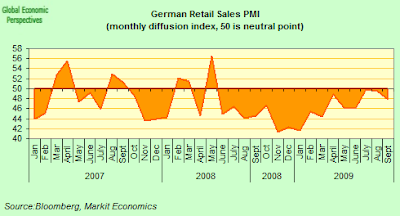 However it is possible to detect signals thatGermany’s economic recovery is losing momentum to some extent since business confidence rose less than expected in September, and this on the back of the weaker than expected PMI readings certainly serves to highlight the fragility of the growth recovery in Europe’s largest economy. 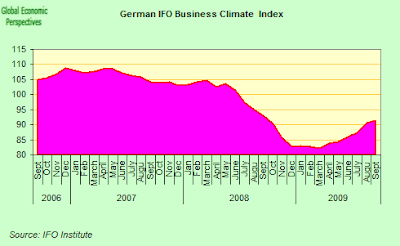 The Munich-based Ifo institute reported its business climate index rose from 90.5 in August to 91.3 in September. That was the highest reading since September last year, when Lehman Brothers collapsed in the US. But it fell short of many economists’ expectations, suggesting that at least some of the recent optimism about Europe’s largest economy may have been overdone. The rate of increase in the Ifo index certainly slowed markedly in September. Hans Werner Sinn, Ifo president, pointed out that most companies still regarded current business conditions as poor, and that the rise in the index had been driven largely by the component covering businesses’ expectations for the next six months – which has risen for nine consecutive months to the highest level since May 2008. German unemployment declined in September, but the fall was due to a seasonal upturn and statistical effects rather than any fundamental economic improvement. The unadjusted jobless rate was 8 percent, down from 8.3 percent in August. A total of 3.346 million people were registered as unemployed — 125,000 fewer than the previous month but 266,000 more than in September 2008. In seasonally adjusted terms, the unemployment rate dipped to 8.2 percent from 8.3 percent, with 12,000 fewer people out of work than in August. Economists had forecast an increase of 20,000. The labor agency drew attention to the fact that the number would have risen by 10,000 but for a change made earlier this year under which those being trained by private job agencies were removed from the jobless figures. 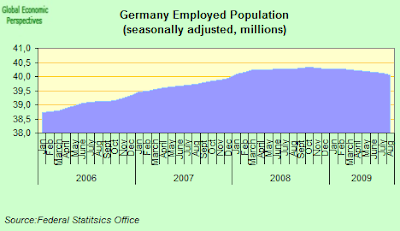 At the same time the number of those employed is falling, and there were 40.01 million people in employment in Germany in August 2009. Compared with the previous year, this was a decrease of 216,000, or 0.5%. In fact the German job machine ran out of steam last autumn, and since that time has been adding jobs at an ever slower pace. 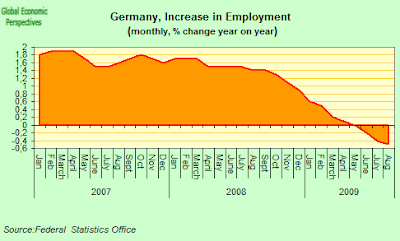 Now it has turned negative, and less Germans are employed every month than they were a year earlier. Jobs have been subsidized by the Federal Labor Agency, which pays 60 percent of the net wage that’s lost due to reduced working hours. The program, extended to 24 months in May from 18 months, supported about 1.4 million employees at some 50,000 companies as of June. As compared with July 2009, there was hardly any change, with the number in employment even rising slightly - by 11,000 (0.0%). But after seasonal adjustment the number in employment dropped by 57,000 (–0.1%) from July to August 2009. In July 2009, the seasonally adjusted number of persons in employment declined by 30,000 (–0.1%) on June. Given the scale of the current economic crisis, the decline in the employment observed in Germany over the last year has been quite moderate. As the statistics office point out the fact that many employees were placed on short-time working significantly reduced the negative effects of the fall in output on employment. 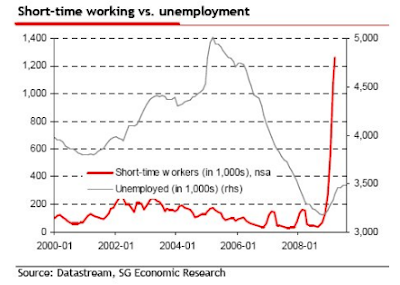 So far, unemployment has been kept in check because many employers have used government-supported short-time working arrangements - Kurzarbeit - rather than laying off workers. However, this is now widely expected to be gradually wound down and hence the number of unemployed will rise significantly over the next year. So How Long Can Kurzarbeit Continue To Run? Well the good news, at least according to analysts at Societe Generale is a good deal longer than many seem to think. The analysts examined the working of the German employment protection programme, and show clearly that while official unemployment in Germany has in fact only risen moderately in the current recession the underlying real effective rate is much higher. The unemployment rate (using the ILO measure) has risen by just 0.6ppt - to 7.7% from its 7.1% low in Q4 2008, while in the euro area as a whole, the rate is up by 2.4ppt to 9.6% from its March 2008 low of 7.2%. As they say, it is also quite clear that this relative stability owes much to the widely-used practice of so called short-time working (Kurzarbeit). 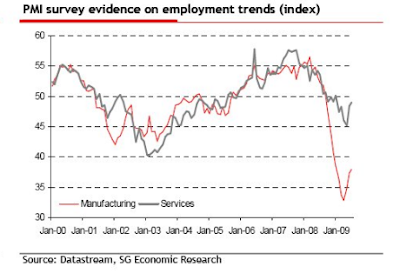 As the SocGen analysts point out, this relatively benign situation could easily turn nasty if company employment intentions deteriorate significantly and growth expectations get revised down. However they are not that convinced by this line of argument, since they think that since German legislation has already extended the period for which companies can run short-time working from 18 to 24 months the programme is pretty firmly supported. Examining in detail the evolution of the numbers on short-time working they find that the vast majority of companies only resorted to the programme in the spring, so that the 24 month limit will not bite until late-2010. 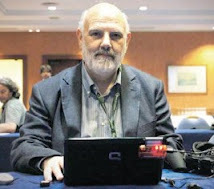 Until the turn of the year 2008/09, the recourse to short-time working was very small indeed. Aside from the seasonal increases in the first quarters of 2007 and 2008, the numbers were small at around 50,000. To put the number in context, they point out that this represents 0.1% of the labour force and is equivalent to the monthly gains in unemployment that were recorded this year. Since then, the numbers resorting to the programme have indeed exploded and by March of this year (the latest available data), there were 1.3 million workers with shortened hours, and this number has probably now risen to around 1.4 million. These are clearly big numbers, amounting to about 3% of the labour force. If they were added to unemployment figures, total unemployment would rise to the previous historic peaks of around 5 million. 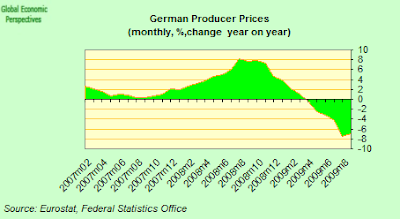 The German consumer price index declined by 0.4% in September 2009 over september 2008, maintaining pressure on existing deflation concerns. 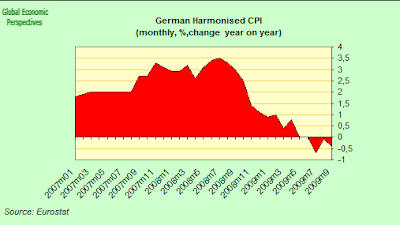 Germany as a whole has never seen such a low inflation rate since German reunification. 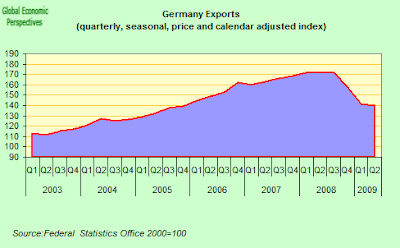 The harmonised consumer price index for Germany, which is calculated for European purposes, is expected to decrease by 0.4% in September 2009 on September 2008 (August 2009 on August 2008: –0.1%). Compared with the Augus the index is expected to be down by 0.4% in September. And producer prices are also falling, with the index of producer prices for industrial products falling by 6.9% in August from August 2008. In July 2009, the annual rate of change was –7.8%. Compared with the preceding month, the index rose by 0.5% (as compared with –1.5% in July 2009). Meantime the ECB continues to try to offer abundant liquidity to get credit and economic activity moving again, though there seem to be few takers. The European Central Bank is lending banks less money than economists forecast in its second 12-month auction of unlimited funds, held on September 30, suggesting banks’ need for cash has eased for now. Banks bid for 75.2 billion euros at the current benchmark interest rate of 1 percent. The ECB loaned a record 442 billion euros at the first auction in June and economists had forecast demand for 137.5 billion euros this month. The ECB, which will offer banks 12-month loans for a third time on Dec. 15, is trying to flood the system with money in the hope it will be lent on to companies and households. Liquidity, liquidity everywhere, but not a drop of inflation in sight. In A Tight, And Embarassing Corner? Angela Merkel did not mince words at last weekends G20, warning fellow world leaders not to make the fight against global imbalances the central issue of the meeting. With Sunday's election looming she came close to accusing the US and Britain of backtracking on the issues of financial market regulation and global limits on bonuses for bankers by shining the spotlight on the export-oriented economic policies of Germany and China. "In terms of handling the aftermath effects of the financial crisis, the biggest problems and the deepest pitfalls are yet to materialize," according to Munich-based Unicredit economists Alexander Koch and Andreas Rees "It is very likely that typical lagging indicators like the labor market and the public deficit will still deteriorate markedly next year," and "big question marks" remain over the sustainability of the recent upswing. A fiscal "exit strategy" is needed to avoid ballooning public debt, set to pass 5% of GDP this year, and even more during 2010. At the same time Merkel want to create a growth-friendly environment for consumers and companies by lowering the tax and social security burden. This balancing act is going to be hard, very hard, in a worl dwhich may just not allow Germany to run up the sort of trade surpluses she has been living from. The German deficit is forecast to rise to 6% of gross domestic product next year, double the amount allowed under normal circumstances under European Union rules. 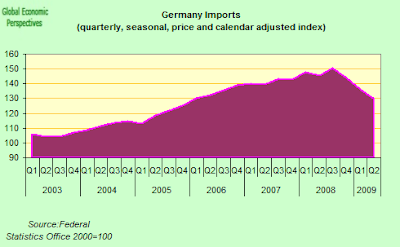 Germany is still expected to see full-year gross domestic product shrink by around 5% in 2009. One of the main acts of the outgoing government was the introduction of a debt ceiling, under which the German constitution now limits federal government borrowing to 0.35% of GDP by the time we reach 2016. What this means is that the new government will really have its work cut out if it wants to reduce the budget deficit and cut taxes at the same time. The only way will likely be via serious spending cuts. Some of these cuts may well come in the area of social benefits, possibly in health care, where the FDP is proposing a basic private insurance, with subsidies for those who cannot meet the costs. On the other hand, the CDU/CSU is essentially committed to maintaining the status quo, having already abandoned its more radical health care reform ideas. This more or less guarantess that a sizeable chunk in savings will have to come in the area of pension benefits, where the CDU/CSU is committed to the planned gradual increase in the pension age to 67. Angela Merkel faces no easy task. She has to manage the exit from the massive fiscal stimulus and financial rescue packages,she has to ensure that the post-crisis economy is a more resilient and more balanced one, she has to address the long-standing issue of an ageing German society where generational inequality is on the rise and where younger generations are now burdened with an even higher debt level. And she has to do all this while keeping alive a coalition with a Free Democrat Party whose proposals on pension reform while certainly far reaching, still raise serious doubts about whether they will be sufficient to address the pension time bomb that is ticking away under an elderly export dependent society whose generous entitlements to pension benefits, healthcare and long-term care are becoming harder and harder to square with the long run growth performance of the German economy.